A ladder will help you climb walls in any base. You can place ladders in area without building privilege, but you cannot remove ladders. This means you need to aquire TC access during a raid to retrieve your ladders or they are lost. 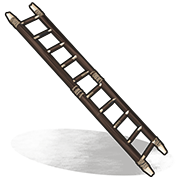 It can be a smart idea to destroy ladders during a raid so counterraiders cannot follow you into the base without ladders.